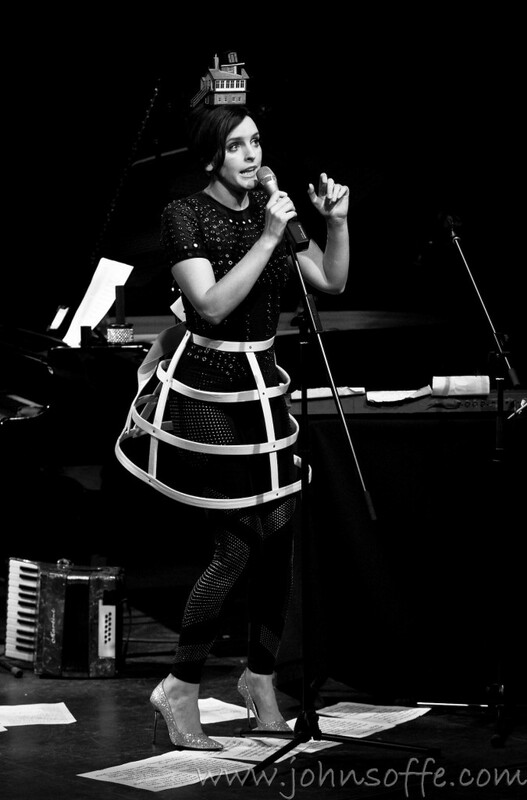 Home / Music / Julie Feeney Wows NY! How It’s New York: Julie is performing at Irish Arts Center, and her brand of fusion and performance has a definite New York vibe to it. We love to see her when she’s in town! How It’s Irish: Julie is, of course. She’s from County Galway. Mike Farragher is bowled over by singer and artist Julie Feeney! “Her voice calls to mind Billie Holliday..
…she powerfully projected her catchy stories and her clever classically informed pop compositions. We reviewed Julie’s last album and concert on the blog last year: check that out here, and listen to her on this podcast! Julie is playing a series of concerts with a seven-piece band at Irish Arts Center through May 6. The glances of performances you caught on youtube might have peaked your interest yet nothing could quite prepare you for the experience of being in the same room as Julie Feeney. The charisma was thick as the fog on the bog as the County Galway composer and performance artist brought her quirky, brilliant show to The Irish Arts Center this week. She glided on the stage wearing a short black dress, her hair in a beehive that was contained in a sequined net. She almost looked like a human microphone, which was fitting because she powerfully projected her catchy stories and her clever classically informed pop compositions. She acted out each song, flirting her way through the aisles the moment the lights dimmed. …she whispered at various points around the theater on “Myth,” the show’s opener. Her voice calls to mind Billie Holliday, an instrument in and of itself that blends seamlessly with the small orchestra that shared the stage. David Baranowski (keyboard, vocals), Joseph Brent (guitar, mandolin), Elizabeth Cary (violin, viola), Mike Kuennen (double bass, electric bass), Jennifer Marshall (vocals, recorder, glockenspiel), Laura Metcalf (cello, vocals), and Terry Szor (trumpet) brought to life the symphonic delicacies from Pages and 13 Songs, her two full length albums and delivered sounds that colored the stage with poignancy or flights of whimsy as per the song’s requests. Kudos to Metcalf and Marshall for providing wobbly, off kilter harmonies that put the song into another orbit. She was a quiet but powerful cyclone of emotions throughout the night, her facial expressions and bright green eyes conjuring up zaniness, vulnerability, and a knowing wink to top it all off! It’s hard to avert your gaze in the presence of such uncommon beauty and divine charm. she sings on “Impossibly Beautiful,” a show highlight from Pages. She could have just have easily written that about a lover….or perhaps it captures the experience of being in her presence during this magical evening? It’s not too late to catch Feeney at the Irish Arts Center, (553 West 51st Street): she’ll be there through May 6. For tickets and showtimes visit www.irishartscenter.org or www.juliefeeney.com.